A couple of weeks ago, I was going through some old photos and found one of Casey as a puppy. It noted his birthday as March 10, 1997. So tonight, we celebrated Casey's twelfth birthday. We took he and the other dogs on a long walk, then later loaded him up into the car and took him to Wendy's for a hamburger (double-stack, no cheese, dry). All the way back from Wendy's, Casey said thank you. And a few times later tonight. 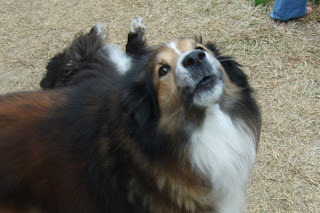 Is Casey a Sheltie or Collie? A sheltie, but a throwback. He is HUGE!